Twenty two years ago in the Soviet Union near Pripyat in Ukraine a man-caused disaster occured at Chernobyl Nuclear Power Plant. This date was taken on special significance not only for the people of Ukraine, Belarus and Russia but for whole world. On this day whole civilized society recalls the events at Chernobyl NPP, recalls the people who unsparingly stood up for a struggle against radiation threat. Let us honour those people whose destinies were broken by this terrible tragedy, those people who prevented the consequences from becoming much more disastrous for humanity. CRPG.ru, a popular Russian games website has announced their version of 2007 results. It is a pleasure to say that S.T.A.L.K.E.R. 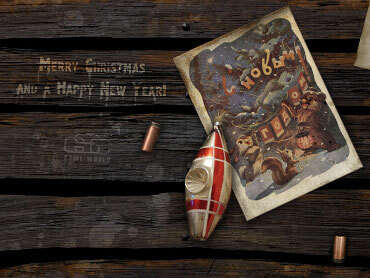 : Shadow of Chernobyl was awarded as "The most atmospheric game of the year" and "The best national game". S.T.A.L.K.E.R. is also a runner-up as "The best close-to-RPG game" and placed 3rd in the nomination of "The best visuals". This said, S.T.A.L.K.E.R. : Clear Sky got in the top ten most wanted games of 2008! Let's talk A-Life, Emergent AI and S.T.A.L.K.E.R. Dmitriy Iassenev, Lead Programmer for S.T.A.L.K.E.R. : Clear Sky gave an exclusive interview on the in-game A-Life, AI development and more to AiGameDev.com. "The gist of the A-life is that the characters in the game live their own lives and exist all the time, not only when they are in the player’s field of view." S.T.A.L.K.E.R. : Shadow of Chernobyl became a finalist in the Game AI Awards a best Mainstream Game AI and a Technical Innovation in Game AI-featuring products. The award was announced by a leading game industry portal Gamasutra in cooperation with AIGameDev.com. Despite the victory want's ours this time, it is an honour to get the high esteem from the organizers. The S.T.A.L.K.E.R. development team wishes you all Merry Christmas and a Happy New Year. We hope the New Year will bring you many interesting events, new friends, positive emotions, and achievements that will improve your life. The most atmospheric game of the year! GameSpot.com, a leading international game portal, has announced the winners of "Best of 2007" initiative. S.T.A.L.K.E.R. : Shadow of Chernobyl was awarded as "The most atmospheric game of the year!" The award is especially pleasing due to the fact that in the nomination S.T.A.L.K.E.R. had to compete against trully the most famous projects of 2007. The fans made a program making use of modifications of the game S.T.A.L.K.E.R. simple and reliable has been released. Smart Mod Manager works with almost all existing mods, and is capable of combining different mods together. S.T.A.L.K.E.R. in Gamespot's "Best of 2007"
Year 2007 nears its end and it's high time conclusions were drawn. GameSpot has launched an open voting to acknowledge the Best of 2007. Pleasingly, S.T.A.L.K.E.R. : Shadow of Chernobyl got nominated in three categories :"Most Surprisingly Good Game", "Best Sound Design", and "Best Atmosphere". The voting will last until December, 24. You're welcome to join in the voting!